Standing in the middle of a parking lot chatting it up with one of the board members from Mississippi Valley Therapeutic Horsemanship; a parent of one of their clients walked up. The parent immediately grabbed the board member's hand and shook it, then went into a deep exciting conversation about how they could not wait for their child's lessons to start again. I could see that horse therapy really did work - for not only for the client, but for the parents and the staff. I stood there that day - kind of invisible - soaking up the energy and noting the rush of emotions - that was when I knew I wanted to share the information about this event and what MTVH does. The Mississippi Valley Therapeutic Horsemanship and the Hope Therapeutic Center have joined with the American Competitive Trail Horse Association to offer a fun filled weekend for a good cause. 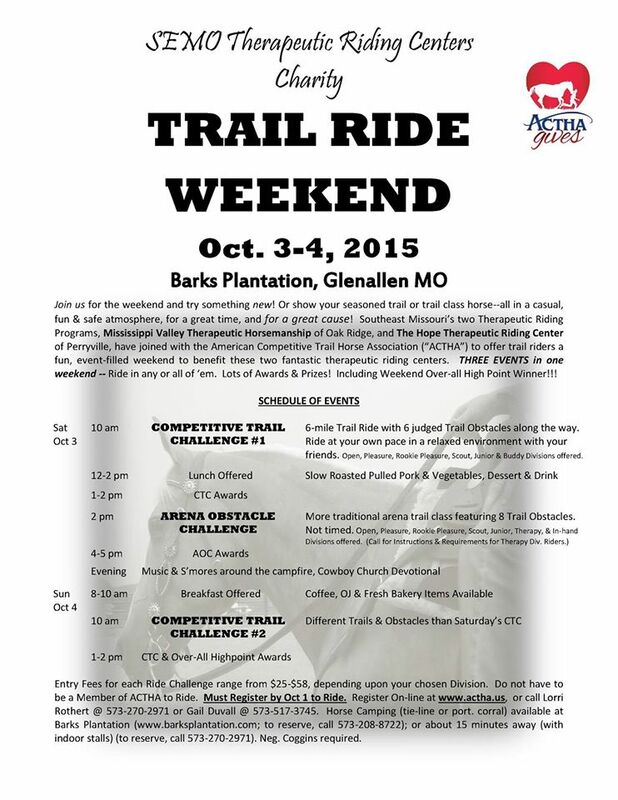 On October 3rd and 4th, Barks Plantation RV Park and Campground will be full of horse riders from all over Southeast Missouri, these riders will be here to support and celebrate the successes reached at both Mississippi Valley Therapeutic Horsemanship and Hope Therapeutic Center. 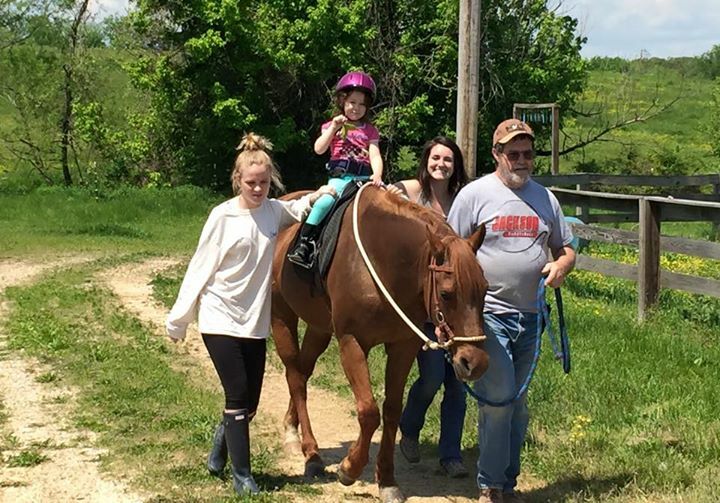 Mississippi Valley Therapeutic Horsemanship located in Oak Ridge and Hope Therapeutic Center in Perryville are both non profit organizations dedicated to therapeutic riding for adults and children living with disabilities. While horseback riding as a pleasure sport has been around for a long time; the idea of using horseback riding as a therapy is still rather new. Horseback riding has been proven to help individuals living with disabilities achieve greater strength, flexibility, communication skills, and build rewarding bonds with not only their trainers, but also the horses. I recently had the opportunity to chat with some of the staff from Mississippi Valley Therapeutic Horsemanship and learn more about what they do and who they are. These people are not only educated and trained about therapeutic riding; but they are also on fire about what they do. Mississippi Valley Therapeutic Horsemanship has a Premiere Accredited PATH facility with PATH certified instructors; they currently serve thirty plus families in Southeast Missouri. The staff and volunteers know their clients, they know their story, and they enjoy watching them succeed. On October 3rd and 4th the organizations will be hosting a joint benefit ride (to benefit both facilities) at Barks Plantation. This event includes three separate competitive trail rides, lunch and live music Saturday, and Cowboy Church. The ride is open to the public, but riders must register on the web at www.actha.usor for more information call Lorri Rothert @ 573-270-2971 or Gail Duvall @ 573-517-3745 before October 1st.